Rest in Peace, Big Mike! Big Mike is steeped in the legacy and tradition not just of Oaksterdam University, but the American cannabis cultivation movement lauding from the radical 1960s- 1970s political era. 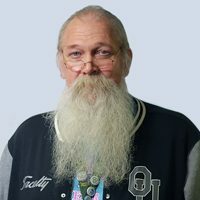 With more than five decades of experience cultivating cannabis, Big Mike brings a holistic and unique perspective to his role as the Lead Horticulture Technician at Oaksterdam. Truly a “grass-roots” grower, Big Mike has been instructing new generations of cannabis cultivators here at the university since 2008. Big Mike is the CEO of both the Oaksterdam Nursery (since 2012) and Oaksterdam “Cones” (since 2010). Oaksterdam “Cones” provides high-quality, tested, pre-rolled cannabis medicine to eager patients at Magnolia Wellness Center in Oakland, CA. For the last forty years Mike has drawn upon, trained with and been mentored by such legendary cultivators as Ed Rosenthal and Kyle Kushman. He is inspired every day to share his experiences and knowledge with the students and alumni of Oaksterdam. Big Mike lives in Oakland, is an avid Harley-Davidson enthusiast, is proud to be the father of eight children and enjoys riding his “hog” and hanging with his Chihuahua, Midnight.